PlasterR offer all kinds of internal and external plastering and finishing so contact us for a free quote if you have a project in mind. We'd be happy to meet you, see the job firsthand and give you our honest opinion. PlasterR have carried out various commercial and domestic contracts in and around the Northamptonshire/Warwickshire area ranging from small skimming jobs to large extensions. 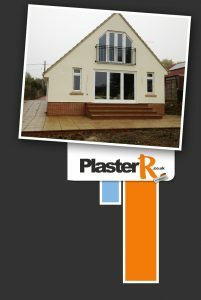 PlasterR undertake all aspects of Plastering, Rendering, Skimming, Dry lining for both internal and external features. PlasterR is run by me, Ramie Yates. I am a plasterer and, after initially completing an extensive apprenticeship with one of the best traditional plasterers in the business, now offer my service and expertise in plastering for you. I have an excellent reputation in and around Northamptonshire with both commercial (builders, architects etc) and consumers (households) in my approach to customer care and quality of work and have a number of genuine testimonials which you can read on the website. My reputation is very important to maintain, thus you will be guaranteed the best possible care, expertise and professionalism at all times - you'll get an excellent job, completely cleaned areas and a competitive price. I have a collection of recent projects in the Latest News and you may have also have noticed, dotted around the website, many of which show before, during and after photos. None of the photos have been retouched or manipulated to look better than they are and again are testiment to my method of working. No job is ever too small or too big so give me a call on 01604 930390 or email me on info@PlasterR.co.uk or use the contact form HERE.